Agricultural areas have expanded dramatically in the tropics, providing food for the world's population, but posing a severe threat to natural habitats and tropical biodiversity. A crop which has attracted particularly negative press and been associated with high levels of deforestation is oil palm. In this talk Ed will discuss some of the negative impacts of oil palm expansion, but also the positives of its very high productivity. He will explore ways that oil palm can be managed for biodiversity and beneficial ecosystem functions, such as pest control and pollination, and ways that oil palm can be managed to make it more sustainable. 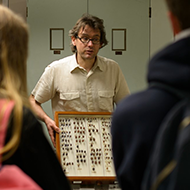 Ed Turner is a lecturer and Curator of Insects at the University Museum of Zoology, Cambridge. He runs two large-scale experiments in South East Asia, investigating the role of habitat complexity in supporting biodiversity in human modified landscapes. In the UK, he also works on threatened chalk grassland butterfly species. He is particularly interested in finding ways that landscapes can be managed to support higher levels of biodiversity while still allowing human use, to develop more-sustainable agricultural production. This webinar is free to join and open to both members and non-members of the IES.